Cystic Echinococcosis (CE) is one of the most important zoonotic helminthic diseases throughout the world. Suitable and appropriate in vitro and in vivo situation are fundamental requirements for any investigations in the field of hydatidosis research. Three types of laboratory animals, Balb-c, NMRI and C57BL/6 female mice with age of 6 weeks were used as host for secondary larva development of Echinococcus granulosus by peritoneal injection. After 5 months all animals were dissected and were evaluated for existence of cyst infection in inguinal region, liver, lung, spleen, brain and muscle. The results have shown that 80% (eight of ten mice) secondary hydatid cyst growth among NMRI strain. The rate of infection in Balb-c was 90%. Most of the cysts were in subcutaneous, site of injection (10 mice). The rate of infection in C57BL/6 was 33.33% and just three of them were infected. There is no meaningful difference about the rate of infection between NMRI and Balb-c mouse, although the number and sum weight of cysts in the Balb-c strain were more than NMRI. Finally, both of NMRI and Balb-c strains can be considered as suitable animal models to produce secondary hydatid cyst. Cystic Echinococcosis (CE) is one of the most important zoonotic helminthic diseases throughout the world . The larval stage of the Echinococcus granulosus leads to hydatidosis . The incidence and prevalence of CE in human and animal hosts is documented in countries with breeding sheep industry, including, Australia, New Zealand, South America, China, some parts of Africa and the Middle East [3-5]. It is also, considered as a significant endemic zoonotic disease in parts of southern and central Europe [6,7]. The importance of hydatid cysts in human is related to the infection of vital organs, especially liver and lung . Given the economic, social and hygienic difficulties of hydatidosis, it seems that extensive research is needed to determine various aspects of the disease that not truly answered yet [9-12] Suitable and appropriate in vitro and in vivo situation are fundamental requirements for any investigations in the field of hydatidosis research . Appropriate laboratory animals can be infected in various approaches such as intraperitoneal, subcutaneous, chest and brain injection by protoscolex . Different strains of natural intermediate hosts of E. granolosus which were infected with eggs, hatched eggs, or activated oncospheres of E. granulosus showed differences in host susceptibility [15-17]. However, egg's infection has been used rarely due to the risk of operator infection . The variability may be reflected in host specificity, development rate, pathogenicity, antigenicity and sensitivity to chemotherapeutic agents, transmission dynamics, epidemiology and control of CE . Some studies have indicated that white mice are a suitable host for development of secondary hydatid cyst [20-22]. Still there is some controversy regarding suitable secondary animal model for experimental hydatidosis. The aim of this study was to evaluate the rate and cyst formation of experimental hydatid cyst models in different inbreed mouse by interaperitoneally protoscolex injection of sheep hydatid cyst. In this study, three types of laboratory animals, Balb-c, NMRI and C57BL/6 female mice with age of 6 weeks were used as host for secondary larva development of Echinococcus granulosus by peritoneal injection. Liver hydatid cyst were collected from Ahvaz slaughterhouse and transported to Parasitology department, Ahvaz Jundishapur University of Medical Sciences. Outer cyst surface were rinsed with 70% ethanol and protoscoleces were collected in sterile conditions and transported to 50 ml falcon tubes. Protoscoleces were washed five times with sterile saline solution and suspension was standing for 20 minutes to settle them. In the end, the precipitants were kept in RPMI 1640 medium. Protoscoleces were examined for 90% viability by 0.1% eosin staining . Approximately 0.2 ml of RPMI 1640 medium containing 2000 protoscoleces were injected interaperitoneally to three groups (n=10) of mice. Mice were held at 20-24°C and 12:12 dark:light photoperiod. After 6 months of post infection the mice were scarified and investigated for hydatid cysts within different internal organs. Hydatid cysts were counted, measured, weighted and investigated for presence of protoscolex. Present study indicated 80% (eight of ten mice) secondary hydatid cyst growth among NMRI strain. The cysts were in mass clusters and located in subcutaneous. There were no cysts in any organs. The weight of biggest was 0.74 g, the total (126) weight of cyst? s was 2.6 g and the largest size was 10 × 16 mm (Figure 1). 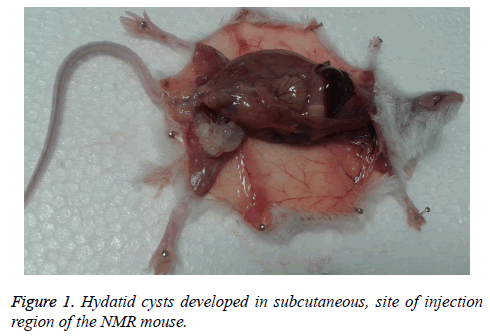 Figure 1: Hydatid cysts developed in subcutaneous, site of injection region of the NMR mouse. The rate of infection in Balb-c was 90% with the high weight of 0.98 g and formed as a cluster. The net of cyst (269) mass was 4.153 g. Most of the cysts were in subcutaneous, site of injection (10 mice). Other site of cyst formation was peritoneal cavity (5 mice), liver (2 mice), stomach flexure (2 mice), lung (1 mouse) and mesentery of small intestine (1 mouse). The largest size of these cysts was 13 × 20 mm (cluster formed) (Figure 2). 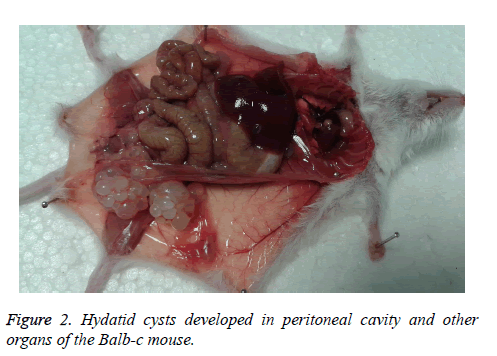 Figure 2: Hydatid cysts developed in peritoneal cavity and other organs of the Balb-c mouse. The rate of infection in C57BL/6 was 33.33% and just three of them were infected, with a maximum weight of 0.021 g that was located in subcutaneous, site of injection (Figure 3). Weight, size and cyst number formed in every mouse are shown in Table 1. Figure 3: Hydatid cysts developed in subcutaneous, site of injection region of the C57BL/6 mouse. Table 1: Hydatid cyst formation in mice infected intraperitoneally with 2000 protoscoleces. Different studies have been done to investigate secondary hydatid cysts by inter peritoneal protoscolex injection and activated oncosphere in different animal laboratory models. Despite some differences, most researchers believe that white mouse is an appropriate model for growth of secondary hydatid cysts [1,23,24]. The results of current study showed that only a few inoculated protoscoleces are able to create cysts in the different groups. The inability of all protoscoleces to develop hydatid cyst may be related to their somatic antigenicity variation which can result in different immune system responses and inefficient protoscolex propagation in the body . Immune cells such as activated macrophages, neutrophils, eosinophils and lymphocytes are mentioned as the main reason for protoscolex [8,25,26]. Due to low pressure of peritoneal cavity, size and weight of cysts in this region are higher than other organs . There is no meaningful difference about the rate of infection between NMRI and Balb-c mouse, although the number and sum weight of cysts in the Balb-c strain were more than NMRI. Breijo et al. have indicated that the establishment and permanence of hydatid cyst is associated with control of early inflammatory response . Both humoral and cellular responses were enhanced through E. granolosus infections in intermediate host . The various dissemination pattern of infection in different mouse is the fascinating point of our study. Based on the results, cysts of NMRI and C57BL/6 strains were limited to the site of injection, while in Balb-c the cysts were observed in different organs. The location of cysts and cyst morphology are related to the host and parasite factors such as the strain of E. granulosus involved . The most likely reason for this difference may be due to be various immune responses in different species and also strain variation of Echinococcus granulosus. Survival of the parasite depends on the stimulation of the host immune system . In some species such as C57BL/6, the response is higher and creates more resistance [31,32]. In infected resistant mice, cellular immunity responds more substantially in compared to other breeds . Our results confirm the issue and indicate that C57BL/6 species is more resistance against infection. It should be noted that the all cysts were sterile and non-fertile. Immunological and humoral reactions may be a reason for non-producing cysts in some animals [28,33]. In addition to cyst size and host features, length of infection also can affect fertile hydatid cyst . Finally, both of NMRI and Balb-c strains can be considered as suitable animal models to produce secondary hydatid cyst. 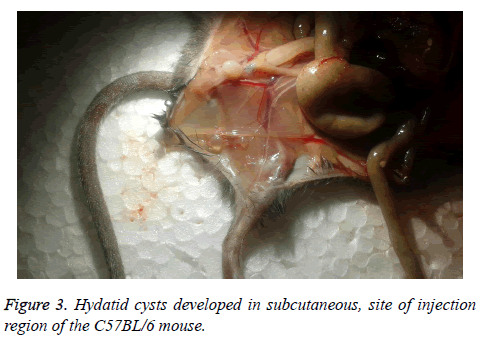 However, the species cannot be used for generating fertile hydatid cyst in short duration. Ahmadnia S, Moazeni M, Mohammadi-Samani S. Hydatid cyst formation in male Balb/c mice following the intraperitoneal injection of live protoscoleces and activated oncospheres: a comparative study. J Parasit Dis 2014; 38: 77-80. Barnes TS, Hinds LA, Jenkins DJ, Coleman GT. Precocious development of hydatid cysts in a macropodid host. Int J Parasitol 2007; 37: 1379-1389. Yang YR, Sun T, Li Z, Zhang J, Teng J, Liu X. Community surveys and risk factor analysis of human alveolar and cystic echinococcosis in Ningxia Hui Autonomous Region, China. Bull World Health Organ 2006; 84: 714-721. Moro P, Schantz P. Echinococcosis: historical landmarks and progress in research and control. Ann Trop Med Parasitol 2006; 100: 703-714. Moro P, Schantz PM. Echinococcosis: a review. Int J Infect Dis 2009; 13: 125-133. Romig T, Dinkel A, Mackenstedt U. The present situation of echinococcosis in Europe. Parasitol Int 2006; 55: S187-S91. Dakkak A. Echinococcosis/hydatidosis: a severe threat in Mediterranean countries. Vet Parasitol 2010; 174: 2-11. Zhang W, Li J, McManus DP. Concepts in immunology and diagnosis of hydatid disease. Clin Microbiol Rev 2003; 16: 18-36. Altintas N. Past to present: echinococcosis in Turkey. Acta Trop 2003; 85: 105-112. Budke CM, Deplazes P, Torgerson PR. Global socioeconomic impact of cystic echinococcosis. Emerg Infect Dis 2006; 12: 296-303. Schantz P, Wang H, Qiu J, Liu F, Saito E, Emshoff A. Echinococcosis on the Tibetan Plateau: prevalence and risk factors for cystic and alveolar echinococcosis in Tibetan populations in Qinghai Province, China. Parasitology 2003; 127: S109-S120. Torgerson P, Dowling P, Abo-Shehada M. Estimating the economic effects of cystic echinococcosis. Part 3: Jordan, a developing country with lower-middle income. Ann Trop Med Parasitol 2001; 95: 595-603. Siracusano A, Delunardo F, Teggi A, Ortona E. Host-parasite relationship in cystic echinococcosis: an evolving story. Clin Dev Immunol 2011; 2012: 639362. Sande MA. Handbook of animal models of infection: experimental models in antimicrobial chemotherapy. Academic Press 1999. Bresson-hadni S, Liance M, Meyer J, Houin R, Bresson J, Vuitton D. Cellular immunity in experimental Echinococcus multilocularis infection. II. Sequential and comparative phenotypic study of the periparasitic mononuclear cells in resistant and sensitive mice. Clin Exp Immunol 1990; 82: 378-383. Guerret S, Vuitton DA, Liance M, Pater C, Carbillet JP. Echinococcus multilocularis: relationship between susceptibility/resistance and liver fibrogenesis in experimental mice. Parasitol Res 1998; 84: 657-667. Gottstein B, Wunderlin E, Tanner I. Echinococcus multilocularis: parasite?specific humoral and cellular immune response subsets in mouse strains susceptible (AKR, C57BI/6J) or ‘resistant’(C57B1/10) to secondary alveolar echinococcosis. Clin Exp Immunol 1994; 96: 245-252. Jenkins D, Thomson R. Hydatid cyst development in an experimentally infected wild rabbit. Vet Rec 1995; 137: 148-149. McManus DP, Zhang L, Castrodale LJ, Le TH, Pearson M, Blair D. Short report: molecular genetic characterization of an unusually severe case of hydatid disease in Alaska caused by the cervid strain of Echinococcus granulosus. Am J Trop Med Hyg 2002; 67: 296-298. Dempster R, Harrison G, Berridge M, Heath D. Echinococcus granulosus: use of an intermediate host mouse model to evaluate sources of protective antigens and a role for antibody in the immune response. Int J Parasitol 1992; 22: 435-441. Al-Qaoud KM, Al-Quraan LT, Abdel-Hafez SK. Cytokine and Antibody Response to Immunization of Balb/c mice with E. granulosus using various routes. Jordan J Biol Sci 2008; 1: 109-115. Rahimi HR, Sarkari B, Mohammadzadeh T, Sadjjadi SM. Immune responses to antigens of reared Echinococcus granulosus adult worms in Balb/c mice. Iran J Immunol 2011; 8: 236. Mourglia-Ettlin G, Marqués JM, Chabalgoity JA, Dematteis S. Early peritoneal immune response during Echinococcus granulosus establishment displays a biphasic behavior. PLoS Negl Trop Dis 2011; 5: e1293. Heath D. The development of Echinococcus granulosus larvae in laboratory animals. Parasitology 1970; 60: 449-456. Jenkins P, Dixon J, Rakha N, Carter S. Regulation of macrophage-mediated larvicidal activity in Echinococcus granulosus and Mesocestoides corti (Cestoda) infection in mice. Parasitology 1990; 100: 309-315. Baron R, Tanner C. Echinococcus multilocularis in the mouse: the in vitro protoscolicidal activity of peritoneal macrophages. Int J Parasitol 1977; 7: 489-495. Thompson R. The biology of Echinococcus and hydatid disease. George Allen & Unwin 1986. Breijo M, Anesetti G, Martínez L, Sim RB, Ferreira AM. Echinococcus granulosus: the establishment of the metacestode is associated with control of complement-mediated early inflammation. Exp parasitol 2008; 118: 188-196. Vuitton DA, Gottstein B. Echinococcus multilocularis and its intermediate host: a model of parasite-host interplay. J Biomed Biotechnol 2010; 2010: 923193. Thompson R, Robertson I, Gasser R, Constantine C. Hydatid disease in Western Australia: a novel approach to education and surveillance. Parasitol Today 1993; 9: 431-433. Emery I, Leclerc C, Sengphommachanh K, Vuitton DA, Liance M. In vivo treatment with recombinant IL?12 protects C57BL/6J mice against secondary alveolar echinococcosis. Parasite Immunol 1998; 20: 81-91. Dai WJ, Waldvogel A, Siles?Lucas M, Gottstein B. Echinococcus multilocularis proliferation in mice and respective parasite 14?3?3 gene expression is mainly controlled by an αβ+ CD4+ T?cell?mediated immune response. Immunol 2004; 112: 481-488. Sakamoto T, Cabrera PA. Immunohistochemical observations on cellular response in unilocular hydatid lesions and lymph nodes of cattle. Acta Trop 2003; 85: 271-279. Thompson R, McManus D. Aetiology: parasites and life-cycles 2001.